The markets have been in a rough and tumble recent period here with a 3.5% decline last week along with a further drop to the 1982 lows so far on Monday. What is likely ahead? The SP 500 probably just completed the initial wave down of an ABC Correction from the 2079 highs. 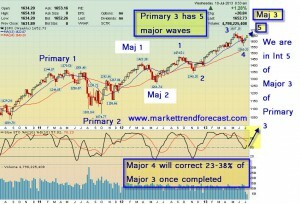 We are counting this correction as a “Wave 2″ of a full 5 wave sequence up from 1820 lows in October. Essentially, Oil is the reason being used by the media for the correction but that is just the convenient headline excuse of the day. Instead, what we will likely see is a Santa rally “B” wave ahead and then another leg down in January to complete this larger ABC move. Elliott Wave theory is very hard to use to accurately forecast movements ahead of time, but we try our best to project, analyze, and then adjust as needed. Our best estimate is the 38% fibonacci retracement of the 259 point rally completed at 1982 today. A “B Wave” rally up from here is normal and a C wave down to the 1920 area would complete a 61% retracement of that Wave 1 259 point rally. Following the completion of a standard ABC Correction we should have a Wave 3 Bullish wave in early 2015 that will challenge the highs of 2079 and likely overtake them. We do not like to get too far ahead of ourselves with the forecasts but we expect the excuse for that rally will be low energy prices and a strong consumer going into 2015. Some of the obvious rally names for January will be energy stocks, but will need to be carefully selected. Gold needs to get past 1241 on a closing basis before we get too bullish on those names, but we have them on watch as well. http://www.themarkettrendforecast.com/wp-content/uploads/2013/08/TMTF-word-header.jpg 0 0 admin http://www.themarkettrendforecast.com/wp-content/uploads/2013/08/TMTF-word-header.jpg admin2014-12-15 14:44:412014-12-15 14:45:14What Now For The US Markets? 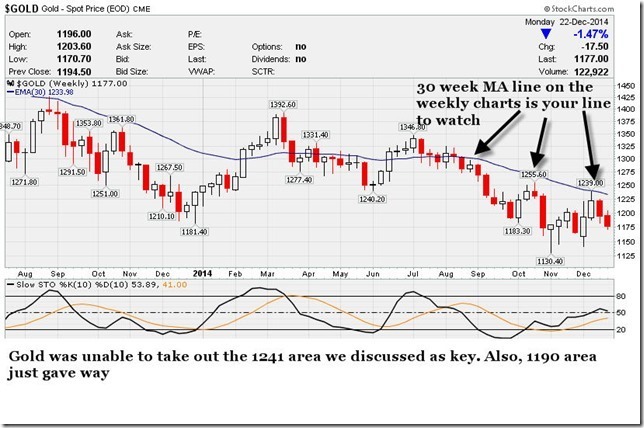 Feb 26th- Gold Due for Pullback Wave 2? A pullback in Gold today to 1320’s from the 1348 high. We had been looking at about 1350 plus minus as an initial objective off the 1181 pivot lows for the truncated 5th wave of the bear cycle. We can see support at $1300 for spot Gold right now in the charts in terms of keeping it simple. Now lets keep in mind we just rallied from 1181 to 1348, or about 167 points which is quite a rally. Indeed, February is often a short term cycle low for Gold and has been in years past. A normal corrective wave 2 would be anywhere from 38% on the low end to 61% on the higher end as likely. Using some basic math, 38% of 167 points is $64 an ounce, giving a possible pivot target of $1284 plus minus a few. So bottom line? We remain bullish long term, short term we may have a minor wave 2 pullback to work off some of this 167 dollar rally in Gold, and 1284 is a 38% fib pivot and 1300 is traditional support. May just need to take a rest here for a bit… otherwise we maintain for now our $1550 target for 2014.
http://www.themarkettrendforecast.com/wp-content/uploads/2013/08/TMTF-word-header.jpg 0 0 admin http://www.themarkettrendforecast.com/wp-content/uploads/2013/08/TMTF-word-header.jpg admin2014-02-26 18:54:322014-05-26 20:53:34Feb 26th- Gold Due for Pullback Wave 2? 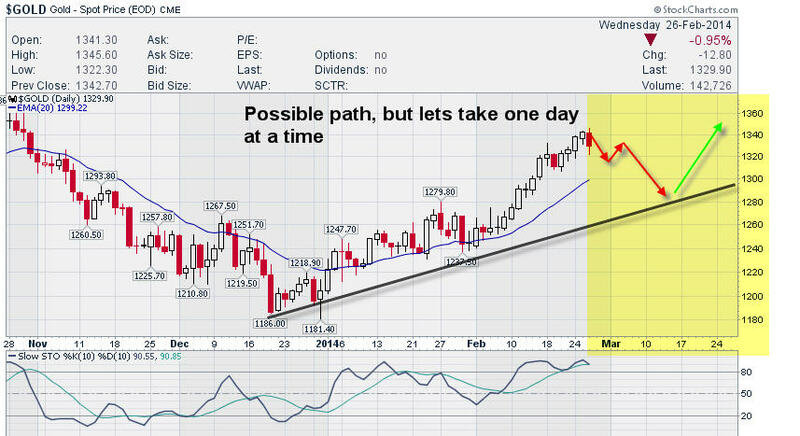 SP 500 at 13 day cycle turn ? The SP 500 has rallied from 1267 to 1848 major 3 highs from Major 2 lows. We had 1822-29 as MOST likely pivot highs for Major wave 3. Now, we note that it’s common during this Major wave 3 pattern to have 13 trading day cycles of correction or consolidation, followed often by up legs. We just completed a 13 trading day cycle in the SP 500 in a range bound area of trade. Therefore, we are about to likely see a big move up or down within 1-2 trading days if we are right. Given that the market is extended and earnings season is just around the corner, we should see a sharp move here next week. 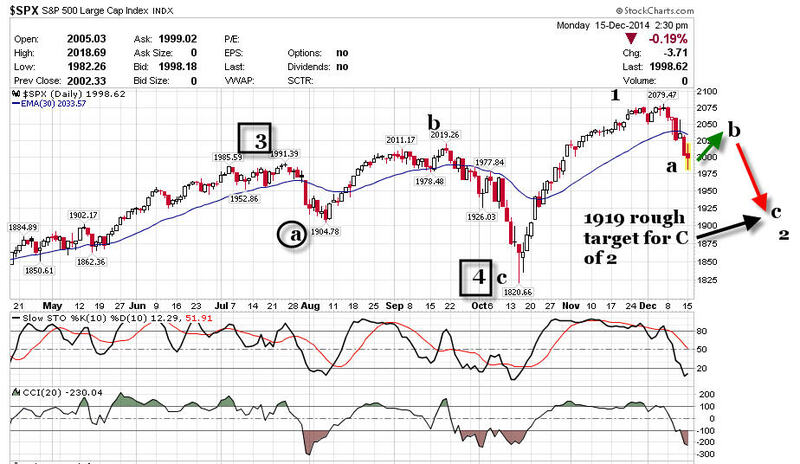 Since we are extended past the idea 1829 projection, we are on guard for market reversal and correction of 7-10%. 2013 by riding the trend and entering and exiting positions using our modeling techiques. At last count, 87% vs 18% for the SP 500 since April 2013 on an adjusted portfolio basis. This also means we are keeping our eyes open for headwinds. If we can get past 1848 near term, then another extension in this Major 3 is upon us. 1823 is now KEY support on the downside. http://www.themarkettrendforecast.com/wp-content/uploads/2013/08/TMTF-word-header.jpg 0 0 admin http://www.themarkettrendforecast.com/wp-content/uploads/2013/08/TMTF-word-header.jpg admin2014-01-09 20:58:072014-05-07 04:38:59SP 500 at 13 day cycle turn ?